A bold new strategy for Disney has once again culminated with what might be its most prestigious modern property – although this time it's by design. Beauty and the Beast was probably the height, creatively, for modern traditional animation by Disney, scoring a Best Picture nomination, the first animated film to ever do so. While it wasn't the highest grosser of these films (The Lion King was the peak there), it's essentially the modern Snow White and the internal standard to which all Disney films are held. In this decade, Disney has now moved towards taking its beloved standards and making live action (well,”live action”) versions of them, including Alice in Wonderland, Maleficent, Cinderella, The Jungle Book and now this remake of Beauty and the Beast. Where in 1991, Disney was still in mostly “anonymous lead voice actor” mode with a couple of exceptions, this live action version goes full-on name recognition. 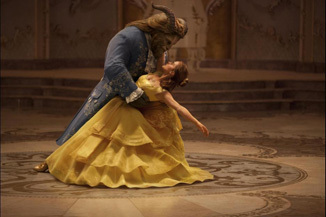 Emma Watson stars as Belle, the great monument to Stockholm Syndrome and “I can *change* him!" thinking, taking her imprisoned father's (Kevin Kline) place at the castle of the cursed Beast (Dan Stevens of Downton Abbey and Legion fame), who has a limited amount of time to make someone love him before he permanently changes. Within this castle are a host of normally inanimate objects brought to life with the voices of Ewan McGregor, Emma Thompson, Ian McKellen, Stanley Tucci, Gugu Mbatha-Raw, and others, with Luke Evans playing the jealous and boastful Gaston and stage veteran Josh Gad as LeFou (with a notably controversial-but-it-shouldn't-be gay subplot, a first for Disney). As with the original, the remake stays as a musical and, well, basically just about everything, being almost a shot for shot remake, just with people and CGI. It does have the benefit of looking gorgeous, if more than a bit redundant, but Disney have long been experts at repackaging material they've already sold to people in a slightly different way to make enormous amounts of money. Reviews have generally reflected the slight cynicism of this move. The critics are generally positive on the merits but note that there's not a lot new here. Still, live action seems to carry a bit of prestige compared to animation even in the world of Disney – or perhaps it's something more like legitimizing the reason for the remake? At any rate, it's been 26 years (yeesh) since the original and there's at least one and a half generations that this is novel to, and a couple more that would like to take those generations to that. That's probably the genius of Disney's move here.